Google Apps is a service from Google that allow you to use several Google products such as Gmail, Google Calendar, Talk, Docs and Sites under your domain. Google offers this service in standard (free) and premium editions, and Google also offers a free version for education institutions. Using Google Apps, you can host your domain’s email at Google mail server. All incoming and outgoing emails are stored at Google mail server so they can be accessed through Gmail under your domain. Standard Edition offers 7GB email quota per user which is the same amount of storage as regular Gmail account. You can also add up to 50 user per domain. If you plan to use Google Apps with a large number of users, Premium Edition is a good choice, and of course you will be charged amount of money of using it. In this tutorial, i’ll use the Standard Edition of Google Apps which is free of charge and suitable for a small group or community. You already have a domain that hosted on a hosting company. You have the privilege to perform server administration tasks such as uploading file and changing MX records. Go to Google Apps Standard Edition page and click the Get Started button. Enter your domain name, eg: yourdomain.com and select the Administrator: I own or control this domain option then click Get Started button. 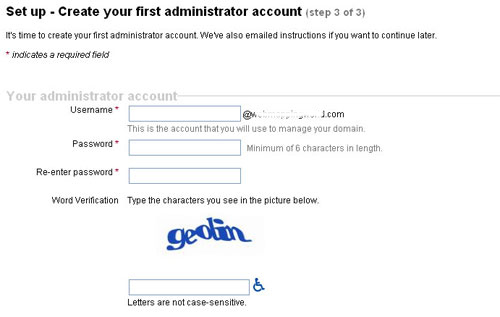 Create your administrator account and remember the username and password correctly. You will use this username to login to Google Apps and create another users for your domain. Before activating your account, you have to verify that you are the owner of your domain . There are two available methods to perform domain verification, by uploading a HTML file to your hosting server or by changing a CNAME record. Choose which is suitable for you, in this tutorial i’ll use the first method, by uploading an HTML file, which is simple and easy to perform. Create a HTML file named googlehostedservice.html and copy the specified text avilable into it. Upload the googlehostedservice.html to your hosting server so it can be accessed under http://yourdomain.com/googlehostedservice.html. Click I’ve completed the steps above to verify. After verification success, you have to wait for 48 hours before you can use Google applications. After setup completed, you can create user accounts so everyone on your domain will be able to log in, access Google applications, and have their own customized e-mail address. Click Users and Groups menu on the right side of Dashboard menu. Click Create New User link and enter the First name, Last name and Username. The username is needed to log in to access Google Apps. The username will also be the basis for their customized email address. For example, a new username of lorensius.wlt will have an email address of lorensius.wlt@yourdomain.com. By default, Google will create a temporary password for each new account, but you can customize a new password by click the Set Passoword link and enter the new password. 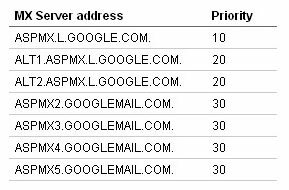 In order to access your email through Gmail, you need to change the Mail Exchange (MX) records on your domain’s host. In this tutorial, i’ll explain how to change MX records on Cpanel based domain hosting services. Google also provides extensive instructions on how to do this for many domain hosting company at a page when you open your Email application (before MX records update process done). It can take up to 48 hours for Google to verify your domain ownership, and to setup your e-mail once you change the mail records. Once you have completed all of the above steps, you will have activated your service and will be able to utilize Google Apps with your domain. To access Gmail application for your domain, use http://mail.google.com/a/yourdomain.com and log in with your username and password. You can add sub domain such as mail.yourdomain.com and redirect it to your Gmail address.